CKUT Radio: Nov. 10th mobilization against Quebec tuition hikes. radio announcement for Nov. 10th mobilization against hikes in tuition fees in Quebec. 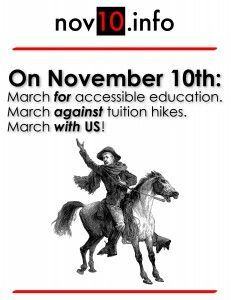 Demonstration on November 10th – March with us! What is the value of a university education? to earn a marketable diploma and make money? The Quebec government is choosing the latter answer over the first, by raising tuition and by privatizing education. The Quebec government is proposing to double Quebec fees relative to when it came to power, and is allowing universities to raise fees for students who aren’t from Quebec. Research shows that up to 7,000 students will be denied access to a university education, because of these fee hikes. Help turn the tide. Education is a right, not a privilege.